After his first year in the top of role of the Mariners, Stanton discussed 2017 and a myriad of other topics including injury prevention, the naming rights to Safeco Field and the current arena situation. The scattered televisions in the offices of Safeco Field were tuned to Game 4 of the National League Division series between the Cubs and the Nationals on Wednesday afternoon. It was yet another unneeded reminder for the Mariners’ employees working in the building that their team wasn’t in the postseason and hasn’t participated since 2001. Meanwhile, trucks and implements sat atop the stripped playing surface of the stadium. It was all dirt with an outline of where the lighter infield dirt remained, offset by the darker soil that sat under the cropped and lush green grass that anyone would love for a lawn. 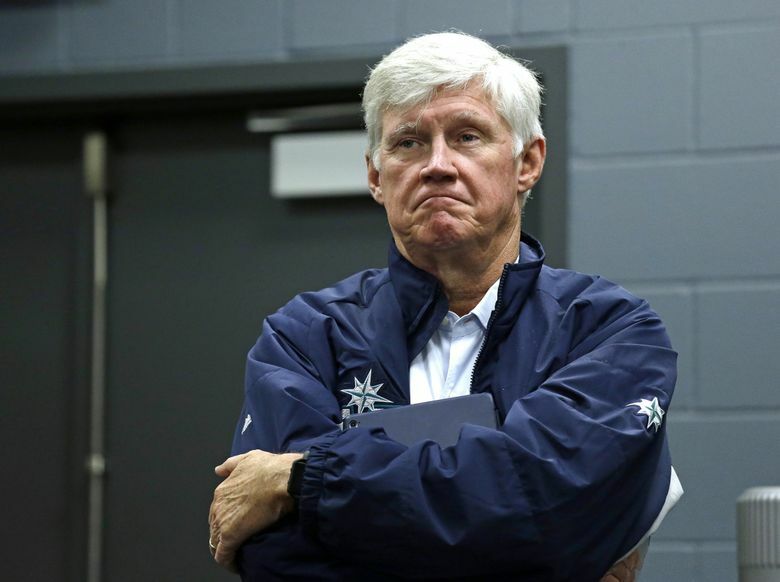 In a conference room somewhere in the maze of offices and rows of cubicles that are unseen to fans, Mariners Chief Executive Officer John Stanton met with a small group of media members to discuss the 2017 season and more. It was his first full season in the lead role following ownership change late last season. Gregarious and more approachable than his predecessor Howard Lincoln, Stanton still found himself in a similar place that Lincoln did in every season after 2001 — lamenting his team’s failure to reach the playoffs. It was more hurtful given the strong expectations of reaching that goal in 2017. Stanton touched on a number of topics over the 50-plus-minute conversation, including his thoughts on this season, the performance of general manager Jerry Dipoto, the contract status of Dipoto and manager Scott Servais, the World Baseball Classic and Mariners injuries from it, the naming rights to Safeco Field, the Seattle arena situation and more. Stanton was obviously asked about increasing payroll going forward and wanting to use money on big name free agents, he also was asked about his message to fans after not making the playoffs. Those answers appear in Larry Stone’s column. What did you think of the season? “A roller coaster. For me, it was the first time that I’ve obviously been in this role and it was more personal. I probably went to as many games as I went to last year. But somehow the highs are higher and the lows are lower when you are here. For me, and I won’t remember the exact game, but when the young man (Evan Marshall) came on and got hurt on the second or third pitch and left the game, so we had used three pitchers in one inning and not intentionally, that epitomized the season in a lot of ways to see that. How do you evaluate the season being the CEO now than in years past as a minority owner? How do you judge the volume of moves from Dipoto and the big picture of where he’s going? “Let me give a broader answer, and it’s really true. My first great boss, a guy named Ed Hopper, who no one has every heard of, said to me: ‘The key to delegating is judge the results, don’t judge the way you would’ve done it.’ I was good with financial analysis and all that and I’d give something to someone and I’d be annoyed because it didn’t come back the way I would have done it. The light went on for me. To a certain extent, and I don’t want to overstate this, but I don’t care how many trades Jerry made. It’s what did we put on the field and how did we do. If you can somehow extract the impact of the injuries from a theoretical sense, should we be in the playoffs? I think the answer is yes. I believe the results (of the moves) are good. It’s been reported that Jerry Dipoto and Scott Servais are entering their final years of their contracts. Do you look to extend them? How do you view the “lame duck” status for a GM or manager? Have you went back and looked at the injuries and found anything that links to it? Or is it just bad luck and one of those years? “Certainly, there is a certain amount of (bad) luck. I was sitting behind home plate when Mitch (Haniger) got hit by the ball in the Mets game. That’s one of the most startling experiences I’ve had in any year. I could hear it. I could see it. I joked with him about it later, but I’ve never seen (trainer) Rick Griffin run to home plate as fast he did when that happened. Luck contributed to our injuries. But I think we need to do a better job in our organization in training. We will focus this offseason on everything from nutrition, to strength and conditioning, to training and all of that … not just the offseason but during the season. One of the challenges for us in doing that is that our players scatter to all four points on the compass. In our case, many of them leave the country. We help them with what they want to do in training. We are certainly responsive. Some stay in town, many come back to town. But there needs to be more done to take advantage of sports science. That’s some of things we are talking about to try and do a better job of. If we can do that and limit the injuries to bad luck, then we ought to do better than others. It’s early now, but what are you expectations for next season? What are you thoughts on the current situation with the proposed SoDo Arena from Chris Hansen vs. a Key Arena renovation from OakView Group? “To be honest, I don’t have new thoughts. You start with the things I said on April 19 last year. We very much want there to be NBA, NHL here in town. I think that this community deserves to have a NBA franchise. I’m still pissed at Clay Bennett for lying to this community. I think it’s terribly frustrating. To have a team, we need an arena that can support it. We never got satisfaction from Chris, and I ended up engaging with Chris directly. But we never got satisfaction on some of the scheduling and parking and transportation related issues. I’m going to put a pin in transportation or traffic and come back to that in a minute. I think that the city (council) solution with respect to Key Arena is a pretty brilliant move on their part. I’m probably the only one in the room that went to the 1962 World’s Fair. And that facility is really rundown at this stage and needs a refresh. And I think that rebuild should be terrific. Whether there are two arenas, or however that ends up happening is not our concern. Our concern is transportation, parking and scheduling. On that pin on transportation, we’ve just gone through a process in a variety of means where we’ve been asking our fans — we did surveys, we did focus groups — to understand them. The thing that is an obstacle coming to games here is transportation and parking. You guys come to every game and I don’t need to tell you that. There’s not only a substantive issue, but there’s also a perception that it’s an issue. We need to make sure we articulate and express on behalf of our fans that those things are a concern. What is the status of the naming rights for Safeco Field? Do you want to have it settled going into next season or the end of next season? Do you want the name or the company to have Northwest or Seattle ties to it? Or are you open to another company not in this area? I will pick Costco because it’s so obvious they would not do it. Costco doesn’t advertise on anything. And I’m on their board so they’d have a conflict to do it anyway. I think Costco would be a great company to align with that way, but there is zero possibility, zero, or less than zero possibility, that they will ever sign up for naming rights or else they would have increase the prices on everything in the store. And they will never do something like that. Jim (Sinegal), Jeff (Brotman), may he rest in peace, and Craig (Jelinek) would never let that happen. We will end with up a partner and will align with us and then do what they call ‘activate’ the branding opportunity and use this as a venue to communicate with their customers and communicates with their employees. What was the thought process on redoing that playing surface of Safeco Field? “It had just gotten to be the time. You’ve all seen Trevor Gooby (vice president of ballpark operations), but probably don’t know he is. Trove runs the ballpark and he worked with (head groundskeeper) Bob Christofferson. They took a look at where we were and took some measurements of the field and decided it was time for us to replace it. You’ve announced that you will add additional netting for fan safety, have you determined how much more? “Those conversations are going on real time. One of the conversations is going on right now. We would expect that after the lease is signed that there will probably be some changes that we will make to the building. To be blunt, we kind of want to see what other people are doing. It’s funny, there is no really right or obvious answer to how much. My understanding in Japan, you’ve got nets pretty much around the building, including the outfield. There’s certainly reason for nets in the outfield, but catching a home run ball is a part of baseball. I’m biased because I took those two little boys, when my guys were your kids’ age, and they always took their gloves to the game. I still think it’s fun when you see the 20 or 30-year-olds carrying their gloves into the game. That’s a part of baseball. Safety is our No. 1 concern, always. That should go without saying. We want our fans to be safe and comfortable in every aspect, from where they park to safe inside of the ballpark. But we also want to make sure they feel that intimacy with our game and our players. My wife and I sit behind the netting because she prefers that. Not that I could catch a ball at my advanced age, but my boys would much rather sit where there is a possibility of catching a ball. Are you satisfied with Commissioner Rob Manfred’s discussing about the World Baseball Classic and injuries, specifically your pitchers? “The WBC represents a dilemma as well. I think it’s in the best interests of the game for it to become more international in every respect. I think the WBC did a phenomenal job of raising interests. One of my partners in my investment business is Israeli born. He hadn’t been to a Mariners game before. He got totally into Team Israel in the WBC. I didn’t have the heart to tell him there weren’t many guys carrying Israeli passports on that team, but he got totally into hat. He had a lot of fun with it and then he came to a bunch of games this year because of that.